You can download the article for free. The Ontario Superior Court of Justice decision was argued on appeal before the Ontario Court of Appeal this past summer but the appeal decision has not yet been released. Last week, Justice Paul Perell, my former Property Law prof, dismissed a $2 billion class action lawsuit filed against Loblaws and Joe Fresh by victims of the infamous Rana Plaza collapse in Bangladesh. The outcome is not a great surprise given the technical legal hurdles the plaintiffs faced in getting an Ontario court to hold a Canadian corporation liable for deaths and injuries suffered in a faraway country. Here is the decision, which is listed as Das v. George Weston Ltd. In this post, I will describe the decision in some detail because I discussed the lawsuit at law conference last month at the University of Toronto and there was considerable interest among the international labour law professors in attendance. However, even then I am skipping large parts of the decision, which runs some 130 pages and over 650 paragraphs. processes at Loblaws/Joe Fresh. Loblaws argued that it had no obligation to take steps to protect the workers, let alone to check if the buildings where its products are made are likely to fall down. Loblaws argued that while it was entitled to monitor supplier factories, it had no obligation to do so. Even when violations of Bangladeshi law and Loblaws’ own supplier code of conduct were identified prior to the collapse of Rana Plaza, Loblaws took no steps to ensure compliance. Violations of health and safety laws were ignored. The fact that the supplier in Rana Plaza could not produce a business licence demonstrating it was legally entitled to operate also did not provoke concern at Loblaws. Loblaws execs did not demand that the business licence be produced. Rana Plaza was built on a drained pond, without proper approvals, and the building was never approved for apparel production. Loblaws was aware that its Joe Fresh products were being produced on storeys added onto the original building, in a country where regulatory oversight is notoriously poor and where there had already been horrific factory collapses and deadly fires due to poor construction and maintenance. Yet Loblaws did not check that engineers had approved the building. For a couple of thousands dollars, Loblaws could have asked an auditor to check the structural integrity of the building, it opted instead to select the cheaper basic “social audit” that specifically instructed the auditor to not look beyond the minimal requirements in the Loblaws supplier code, which focused on employment-related rules. If the moral test was whether Loblaws execs would have taken more steps to ensure the factory was safe if their own family members were working there, then surely Loblaws failed that test. Interestingly, Justice Perell opens his decision with parallel quotes from the Bible’s Story of the Good Samaritan and the famous dicta from the classic duty of care case Donoghue v. Stevenson. Perell was noting from the outset that this case was not about the moral obligation to help the vulnerable when we have the means to do so, but instead the much more limited legal duty of care in tort law. That’s an interesting juxtaposition given that corporate social responsibility is supposed to be about going beyond the bare minimum of the law to ensure that workers are protected. Far from confirming that Loblaws did all it could reasonable do to ensure workers making Joe Fresh goods were safe, Das v. George Weston sadly confirms the vacuousness of Loblaws’ CSR program. I will provide a very quick overview for those interested in the technical law behind the decision. The following facts are listed in the decision. On April 24, 2013, a building in Savar, Bangladesh called Rana Plaza collapsed, killing 1,130 people and injuring thousands more. On the day before the collapse, cracks had been seen in the building and engineers ordered the building evacuated. The next day, the building owner said (falsely) that the building had been ruled safe and apparel workers were ordered back to work by their employers. Loblaws had been sourcing its Joe Fresh apparel line from Bangladesh since 2006 because the workers there are among the lowest paid in the world, earning between 25 and 33 cents per hour. Some of the workers producing Joe Fresh goods were children, mostly young girls, below the age of 18. Between 2007-2013, Loblaws imported over 13 million garments from 73 Bangladeshi factories. Loblaws’ main supplier in Bangladesh was Pearl Global, which subcontracted the work, with Loblaws’ knowledge and consent, to an operation called New Wave which operated out of Rana Plaza. Annual orders from New Wave amounted to about $6 million in business. Of the Rana Plaza dead, 1,167 were New Wave employees, many of whom were working on Joe Fresh products when they died. About 50% of New Wave’s ordered were from Loblaws in 2013. The supplier contract between Pearl Global and Loblaws required that goods be produced in compliance with Loblaws’ CSR standards and all legal requirements and permitted Loblaws to conduct on-site compliance inspections, although there was no obligation on Loblaws to actually conduct those inspections or to remedy any violations. Although the contract permitted Pearl to subcontract the work, it did not require subcontractors to become parties to the supplier agreement and therefore Loblaws retained no direct control over subcontractors and nor were subcontractors required to comply with Loblaw’s CSR standards. In fact, one of Loblaws’ central arguments in the case was that it has no control at all over the subcontractors retained to make their goods beyond the possibility of cutting orders, which in New Waves case did not happen. In 2011, Loblaws retained the giant social auditing company Bureau Veritas to conduct $1200 basic ‘social audits’ of New Wave’s factory at Rana Plaza to check for compliance with Loblaw’s supplier code of conduct. Loblaws’ CSR document includes standard references to core labour standards and an obligation to comply with local laws, but as both Loblaws and Bureau Veritas emphasized in court, it did not include any obligation on anyone involved to check if a factory is likely to fall down. After the collapse, Galen Weston, Chairman of Loblaws Companies, acknowledged in a speech that “workers were exposed to unacceptable risk” when Loblaws’ did not audit for structural integrity [para. 128]. Loblaws moved, successfully, to have that admission struck from the plaintiff’s pleading as being contrary to the Apology Act. Bureau Veritas (BV) conducted audits of New Wave at Rana Plaza in February 2011 and April 2012. In the first audit, BV reported 21 instances of non-compliance including 11 violations of health and safety rules. In the 2012 audit, BV reported 9 violations. In both audits, BV reported the absence of a factory license which was required under Bangladeshi law in order to operate an apparel production business. Remarkably, as Justice Perell notes, “the remediation of the deficiencies noted in the social audits was not followed up on by either Loblaws or [BV]” (para. 68]. Loblaws did not insist on production of the business licence or on the correction of the health and safety deficiencies and in fact it increased its orders from New Wave. In January 2013, Loblaws terminated its relationship with BV and retained a new auditing company that had not visited Rana Plaza prior to the building’s collapse. I’m working on a longer law journal length paper that will explore the legal arguments and the decisions. It is sufficient to note in this blog post that the legal arguments were highly complicated. I needed to draw a flow chart as I was working through the various pleadings. Here is the flowchart I created from the pleadings (before the decision was released) for the purposes of describing the case at a recent law conference. Justice Perell basically followed the route charted. I will just quickly summarize the main arguments for you legal beagles. The plaintiffs sued BV as well as Loblaws, but I will focus on the Loblaws action in this post. The lawsuit was a class action, and the named plaintiff’s included survivors of the Rana Plaza collapse and a person who lost two sons and a daughter-in-law in the collapse. The class of plaintiffs would eventually include family members of people killed in the Rana Plaza collapse, and people who suffered injuries in the collapse but who survived. The defendants included a group of related companies of George Weston and Loblaws, including Joe Fresh (Loblaws Defendants) as well as BV. The essential legal theory of the Plaintiffs’ tort case is that Loblaws, knowing of the notoriously dangerous workplaces in Bangladesh, voluntarily undertook the responsibility of ensuring that the buildings in which Joe Fresh garments were being manufactured by vulnerable employees, were safe and structurally sound. The lawsuit also alleged vicarious liability and breach of fiduciary duty, both of which were also dismissed by Perell. Both sets of defendants filed a motion to dismiss the lawsuit on the basis that it was “plain and obvious” that the case does not raise legally viable claim. Justice Perell was required to decide a long series of legal questions to determine the outcome of this motion. Ultimately, he sided with the defendants and dismissed the lawsuit. Does an Ontario Court have Jurisdiction Simpliciter to hear the Case? The first question was whether an Ontario court has jurisdiction to hear the case in the first place. Perell ruled that it does. The test for jurisdiction simpliciter was described by the Supreme Court of Canada in Club Resorts v. Van Breda. Essentially, an Ontario court has jurisdiction provided that there is a “real and substantial connection” to Ontario. That connection is made provided that one of four “presumptive connecting factors” exists. Those factors include that the defendants are resident in Ontario and carry on business in Ontario, both of which are true of both sets of defendants in this case. Loblaws’ various arguments why the real and substantial connection test should not apply, including a lengthy argument that class members needed to personally ‘attorn’ to the Ontario court before the lawsuit could proceed, were dismissed by Justice Perell. Which Substantive Law Applies to the Case, Ontario or Bangladesh? The lead case on choice of laws in this respect is Tolofson v. Jensen, in which the Supreme Court gave preference to the factor of lex loci – the location where the activity causing the harm occurred. The plaintiffs argued that the actions that form the basis of the legal wrongs alleged in the lawsuit occurred in Ontario, although the harm ultimately produced by those actions was suffered in Bangladesh when Rana Plaza collapsed. For example, the plaintiffs argued that the contracts between Loblaws and Pearl and Loblaws and BV were negotiated in Ontario, that the decisions on what sort of monitoring to require, and the decisions not to follow up and require remediation of corporate code and legal violations all occurred in Ontario. However, Justice Perell dismissed that argument, finding that the plaintiffs had sought to plead the case so as to create an artificial link to Ontario when in fact the lex loci was Bangladesh, where the harm occurred and where the plaintiff’s reside. As an alternative argument, the plaintiffs argued that exceptions to the lex loci rule apply here so that Ontario should take jurisdiction, including: (1) that Bangladeshi tort law is insufficiently developed to be ‘proveable’; (2) that Bangladeshi law does not permit punitive damages; and (3) the application of Sharia law, which would confer twice the amount of damages on some male plaintiffs as female, an outcome that is contrary to Canada’s principles of gender equality. Justice Perell dismisses all of these arguments. Firstly, he ruled that there is a long history of tort law in Bangladesh so that the claim the law is not proveable is insulting. Secondly, he is not convinced that punitive damages are not available under Bangladeshi law and, in any event, it is highly unlikely they would be awarded in this case anyways. Thirdly, while he agrees that Canadian courts should not apply a foreign, discriminatory law, insofar as Sharia law would apply here, an Ontario court could sever the offensive Sharia law (para. 298). Is it Plain and Obvious that the Lawsuit Cannot Succeed Under Bangladeshi Law? The experts disagreed on many conclusions on Bangladeshi law, but ultimately Justice Perell concluded that the lawsuit was barred by the one-year limitation period for lawsuits alleging wrongful death and personal injury under Bangladeshi law. The lawsuit was filed just short of two-years after the Rana Plaza collapse. This was the same finding reached by a Delaware court in a similar lawsuit brought against Walmart, JC Penny, and Children’s Place. However, that limitation period does not apply to children. The one year limitation is tolled until the person meets the age of majority. It is not clear how many children were working in Rana Plaza, but Perell assumes that there were some. Perell next considered whether it was plain and obvious that the plaintiffs cannot succeed under Bangladeshi law. He concluded that it is. Drawing on expert evidence, he concluded that Bangladeshi law would not recognize a duty of care existing between Loblaws and people in Rana Plaza. 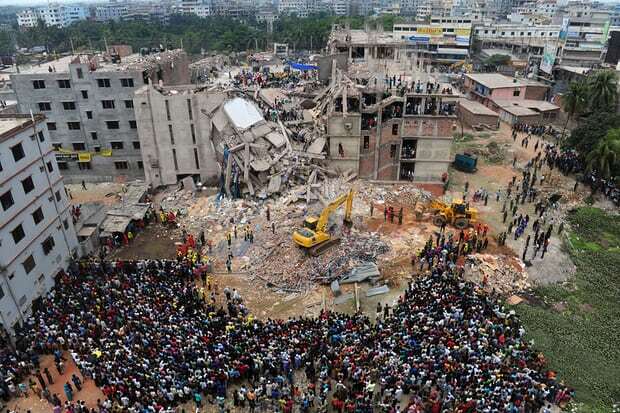 No duty of care had ever been found that between a buyer of goods and workers employed by a subcontractor and there was no reason to believe a Bangladeshi court would find that Loblaws owed a duty of care to people in Rana Plaza at the time of the collapse. Is it Plain and Obvious that the Lawsuit Cannot Succeed under Ontario Law? Perell found that the sort of harm that occurred was a reasonaly foreseeable consequence of the actions (or inactions) of BV, but not of Loblaws. The decision does not fully explain this outcome, and I find this part of the ruling dealing with the duty of care analysis to be somewhat unclear. For example, if it is reasonably foreseeable that a failure by BV to properly perform its auditing of Loblaws CSR standards could result in the harm, then is not also the case that the harm is foreseeable if Loblaws’ decides to ignore clear violations of those very standards reported by BV? Perell again emphasizes that Loblaws may have failed in a moral duty to the workers, but the legal duty is much narrower (para. 522). It is arguable that Justice Perell applied an incorrect test in his assessment of foreseeability in his duty of care analysis as it applies to Loblaws. He concluded that “it certainly is not plain and obvious that a purchaser of goods does or should have a legal duty of care to the employees of a manufacture of those goods.” (para. 524) Does that sound like the proper test on a motion to dismiss? Do the plaintiffs need to persuade the court that it is plain and obvious that a court could not find a duty of care owed to employees of the manufacturer? Or do the defendants needs to persuade the court that it is plain and obvious that the court could not find such a duty? Do you think this is an important difference? In any event, Justice Perell continues on and also finds that the Anns proximity requirement is not satisfied for either defendant, Loblaws or BV. He noted that there is no legal proximity between Loblaws and New Waves’ employees, let alone other people in the Rana Plaza at the time. Nor can proximity be satisfied by an argument that Loblaws assumed responsibility for workers in Rana Plaza. The relationship is too remote such that it would be unfair or unjust to impose a duty of care on Loblaws for workers in Rana Plaza. Justice Perell also finds that policy concerns favour not recognizing a legal duty of Canadian corporations to the workers of suppliers in other countries. These policy concerns included the prospect of “indeterminate liability” flowing from difficulties in determining who is owed a duty and who is not, and the prospect of “massive extension of liability” imposed on Canadian companies who purchase from foreign suppliers. In addition, Justice Perell is concerned that companies like Loblaws, which do “good deeds” by introducing CSR standards would be punished and discouraged from taking any steps to help workers, whereas companies that do not adopt such standards would not (see para. 525, 536). This last point is ironic, since in fact Loblaws did little other than adopt a piece of paper listing standards. History is full of people, and corporations, who claimed they do good deeds but who in fact do the opposite. Action is what matters. What steps did Loblaws take to protect Rana Plaza workers making Joe Fresh apparel? It paid for a limited “social audit” rather than a slightly more expensive audit that included a structural assessment of a building constructed on a drained pond in a country known for flimsily enforcement of building codes, and then ignored the violations even that limited audit uncovered. It certainly was no Good Samaritan. But perhaps Justice Perell’s reference to Loblaws’ ‘good deeds’ simply reaffirms how very little we should expect from corporate social responsibility. I understand that the plaintiffs are considering whether to appeal. Once my longer law journal paper is done, I will post it here for anyone interested. Comments welcome, as always. Thanks for your succinct review of this case. I would love to get a copy of your law journal when it’s complete.